Grilled Portobello With Cauliflower Onion Mash is quick, tasty, vegan, & gf. When you use portobello mushrooms in your dish, somehow, it becomes fancy. 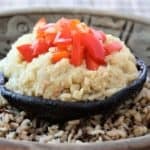 Grilled Portobello With Cauliflower Onion Mash is ready in less than thirty minutes, requires only five ingredients and still is a filling, delicious and yes, fancy lunch or dinner. 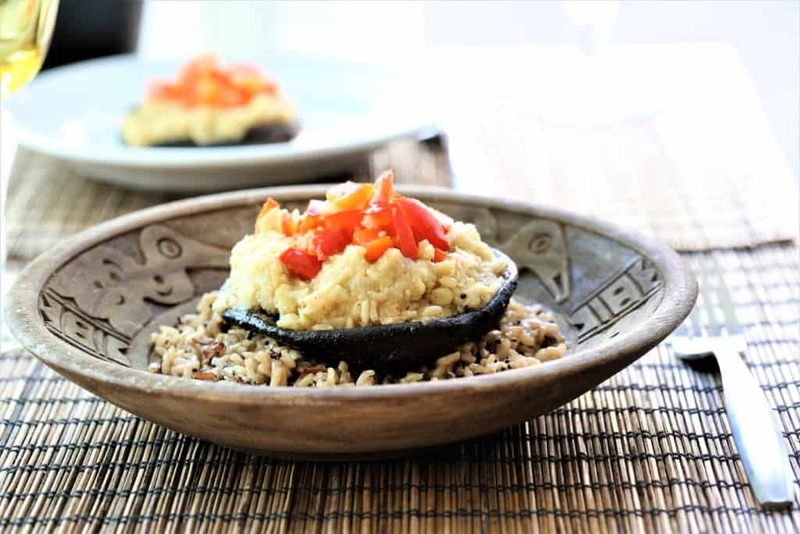 This dish also has other cool options–serve the cauliflower mash as a side dish, or use smaller mushrooms, and create a fancy appetizer on game day. Vegan, gluten free and dairy free. Grilled Portobello With Cauliflower Mash. Creamy and delicious. Vegan, gluten free, dairy free. 8 oz precooked quinoa or rice. 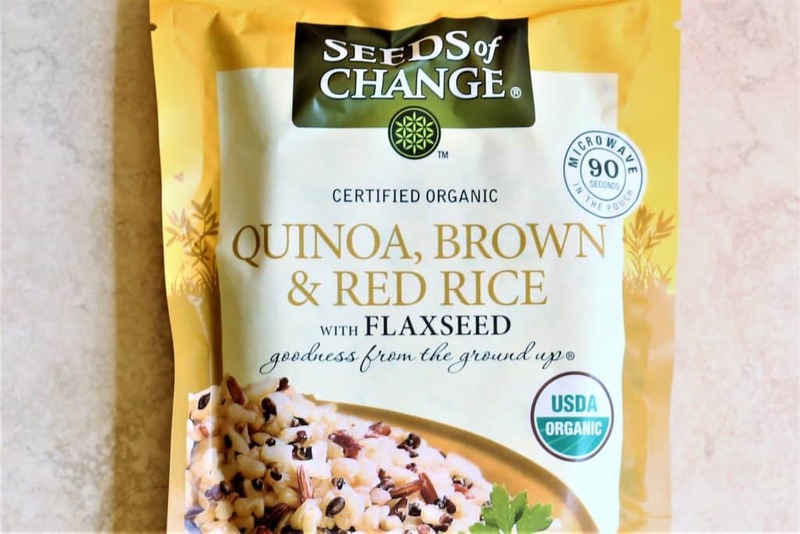 I used Seeds of Change Quinoa Brown & Red Rice. Drizzle olive oil on mushrooms, both sides and sprinkle evenly with salt, pepper and granulated garlic. Saute cauliflower, onions, salt, pepper and granulated garlic in olive oil for 10 minutes or until soft. Remove from pan and mash with small mixer. Add few drops of water if needed to get desired creamy texture. Saute red pepper for 5 minutes. 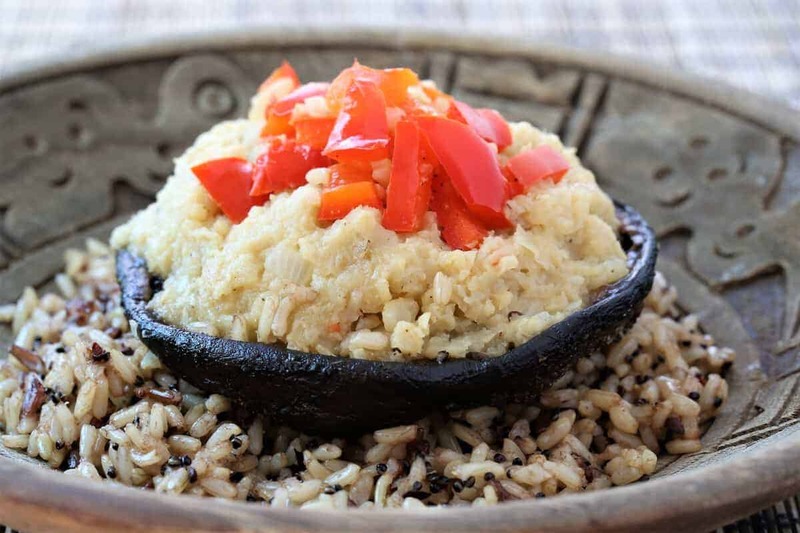 Serve cauliflower and onion mix inside grilled portobello on bed of quinoa, brown and red rice and top with red pepper. For more recipe photos go to Instagram.